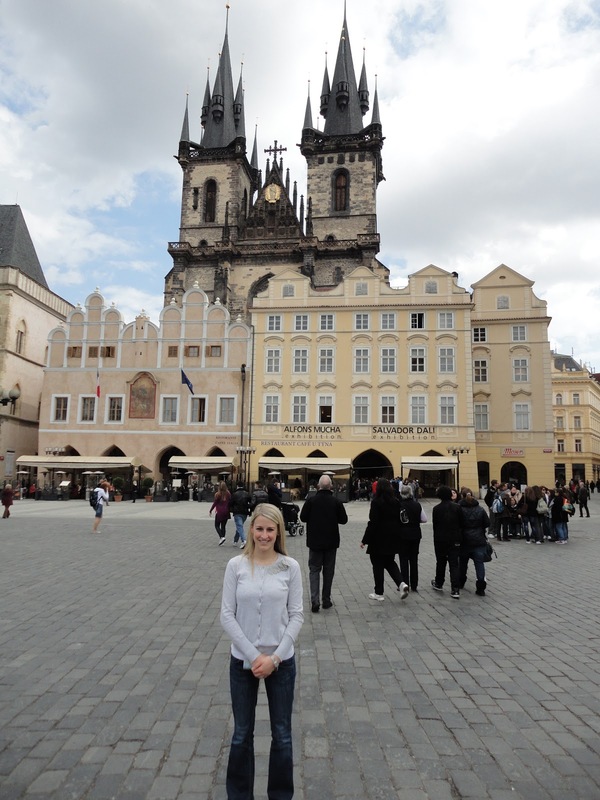 After a 4.5 hour train ride from Vienna, Austria, we arrived in Prague. Coming out from the train station was like entering into another world and another time period. The city is old. And by old, I mean delicate and beautiful. 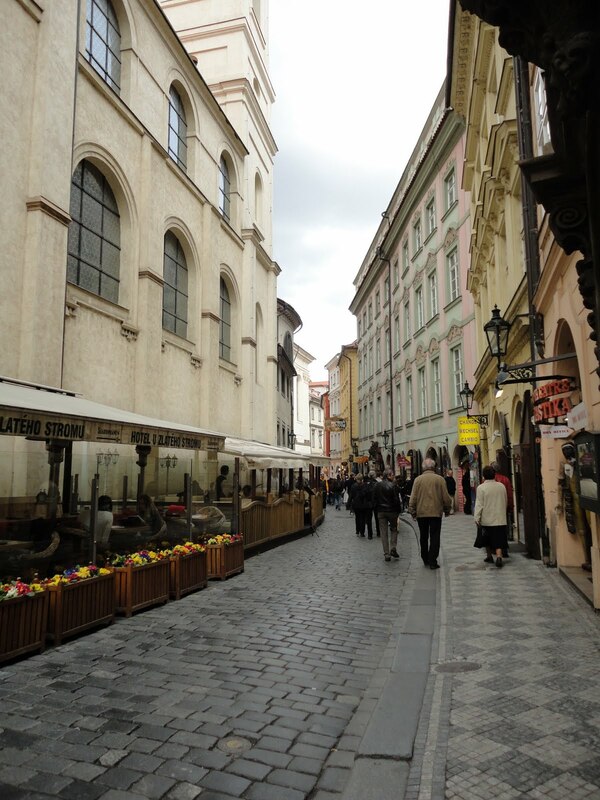 We rolled our suitcases over the cobblestoned streets and walked the half mile to our hotel. (I thought the wheels were going to fall off my suitcase) We stayed at the Sheraton Prague Charles Square Hotel. It was a good location - walking distance to the city center and across the street from Charles Square. It was a comfortable hotel, I would recommend it. Our first night in the city was interesting. After being treated slightly inconsiderately at two restaurants, we finally found a corner cafe to eat some dinner. Our waiter was great... and the beer - yum! It's hard to tell from this picture, but we were cracking up watching everything happen here. There are no street lights and no stop signs at this very large & busy intersection. A tram, pedestrians, cars and bikes are all turning and going at their own will. To us... it looked like a big accident waiting to happen. This is the Cathedral inside of Prague Castle (which is the largest square foot castle in the world). 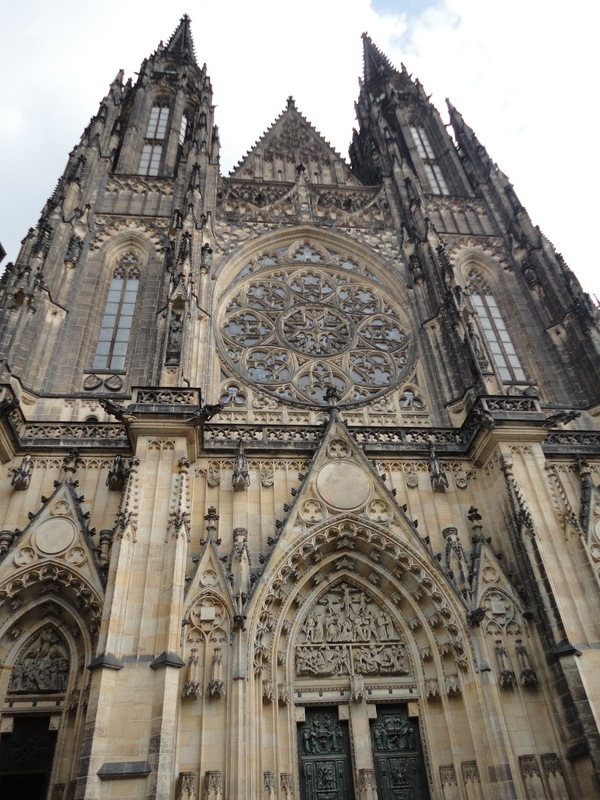 It's called St. Vitus Cathedral and it took over 600 years to build. In fact, it was just finished at the beginning of the 1900's! 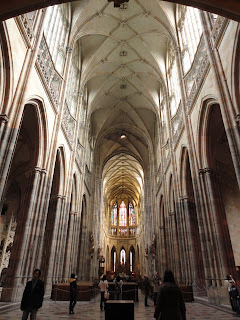 Inside of St. Vitus, you can see where it started getting built back in the 1300s. It's yellow because it's aged! Our second day, we ate lunch at one of the cafes in the Castle... I pointed at something on the menu to eat... and when it came, it was a mayo sandwich. Probably half a cup of mayo squashed into a sandwich roll with a piece of ham. Eeek. TL thought it was hilarious. Posing in front of Charles Bridge... construction on it started in 1357 - it's old! Closer view of the bridge. Notice it is lined with statues - during the summer, our tour guides said you can hardly walk across it because it is so crowded! We noticed these very weird statues while we were walking around. No clue what they are about! Met some friends at our hotel - Richard & Cheryl. We had so much fun talking with them... we didn't make it to bed until the very wee hours of the morning that night! It was a blast. View of Prague Castle from the roof of our hotel... gorgeous! Beautiful city - this is one of the views from Prague Castle! 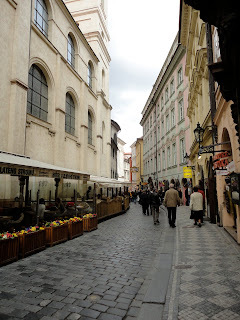 Walking through the city streets... beautiful, narrow, and old! Charles Square... just before we left Prague! Who's been to Prague? Did you love it? Jealous! It sounds and looks so much fun!!! OMG I want to go to Prague! Vienna too! I've done my fair share of traveling but these are 2 places I've never been and am DYING to go to! Lucky! Prague looks so beautiful..I've been wanting to go there and now your pictures make me want to go even more! Looks like you 2 had a blast! I've never been to Prague but I'm adding it to my list now! And of course the city is beautiful! Look at that cathedral - so stunning! I've never been but I have heard nothing but great things about it! And my guess for the next spot - Berlin! 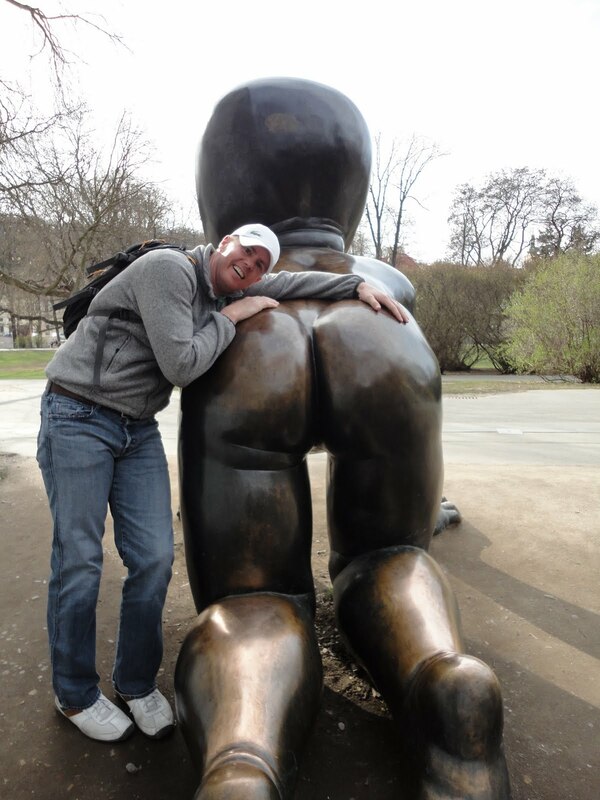 Prague is in my top 5 places I want to see! I'm glad you had so much fun. Gorgeous sites! I'd love to go see the pretty castles and tour like you did. These pictures are gorgeous! My mom wants to visit Vienna in the next few years and this makes me extra excited about it! You look like you had a wonderful time! The photos are great. 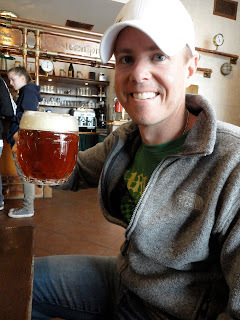 Prague is on my 'to visit' list! You're making me want to go to ALL of these places!! So gorgeous. I would love to visit Prague - it looks gorgeous there! I love your last picture with you jumping mid air - yahoo! Hey sweet girl, thanks for commenting on my blog, it's so nice to meet you. I'm enjoying surfing around yours. I'll be back to read more for sure. Okay it looks like you had an AMAZING time! OMG! I love your blog! Thanks for shouting out Richard and I on your Prague page...we had so much fun on that trip and had we're so glad we met yall. Where are we going next? !